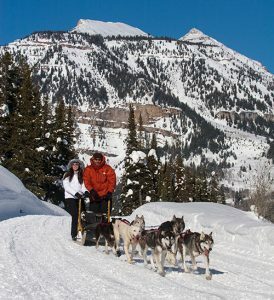 Guiding you, our guest, down through the spectacular wilderness areas of Jackson Hole is the easier part of our job; the more difficult is providing you with a sense of what to expect from a Jackson Hole Iditarod Sled Dog Tour. The sled dogs, our valued partners, will make your trip more memorable. For guests who wish to drive a team, we offer a brief orientation session. This includes teaching the basic commands, accompanying him or her for a short run and introducing each member of the team. Then, WE’RE OFF! No amount of telling ever substitutes for experience! Our dogs are manageable, well-trained, experienced athletes, but they are also affectionate and friendly. Our partners are 170 authentic Alaskan racing sled dogs. They combine the strength, stamina, and speed of the original Eskimo work dogs, with the best of the breed of several Northern huskies. Our dogs are the descendants and siblings of those dogs of spirit and heart who have raced in and won the Iditarod. No other method of travel over snow can compare with dog sledding. the only sounds are the shushing of the runners, perhaps the panting of the dogs and the wind in your face. This trip to the past is one you will never forget.